Unfortunately I missed this year’s North American International Auto Show, also known as NAIAS, after attending it every year since 1997. Fortunately, there was another “auto show” going on the week before in Las Vegas. Did I say auto show? Oh I meant International Consumer Electronics Show (CES) where they show off a lot of technology and some of it featured on four wheels. Ford and Audi both keynoted at the show. Nissan had a local LEAF drive and Automotive Rhythms hosted a Nissan LEAF “Electric Party” at The Palms. Nvidia brought the Tesla Model S for a quick show-and-tell. There was even an in-vehicle technology track for those who wanted to know more about the latest automotive technology. 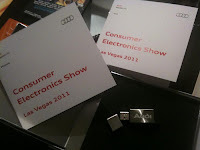 I spent some time at the show watching Audi’s keynote. 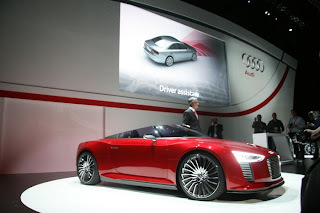 They came with their R8 E-Tron Spyder Concept and the Audi A7L. Audi showcased their relationship with graphics chip maker Nvidia Corporation. “German engineering meets Silicon Valley,” Audi CEO Rupert Stadler shared with the crowd of a couple hundred people who watched him roll out onto stage in the revised E-Tron concept. Nvidia founder and CEO Jensen Huang joined Stadler on stage where they shared the latest Navigation system and coming in-dash LCD instrument panel. The graphics definitely wowed the crowd and showcased how the merging of technology and automotive engineering can come together to really impress an audience who can respect what it takes to make such an impressive computer on wheels. CES even had an automotive reveal at the show – The Ford Focus EV. My flight left right as Ford’s Alan Mulally took the stage to reveal the new electric Focus. Ford made a big splash at last year’s CES with the debut of their MyFord and MyLincoln Touch systems. It may not be as comprehensive as an auto show, but CES is finding its own niche in the automotive world. Now next year if only I can find a way to get into the Automotive Rhythm’s party and better plan my travel to stay around to hear Mulally speak, I won’t feel so bad missing NAIAS again.